In Modern Editor, use bold and italic styles to make one word a different color in your design. Update the color of one word in your text area. 2. Click on your text block from the preview panel (right side). 3. 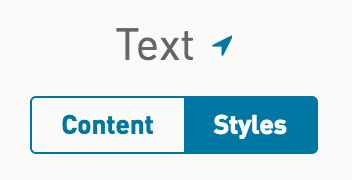 Select the Styles tab from the edit content panel (left side). 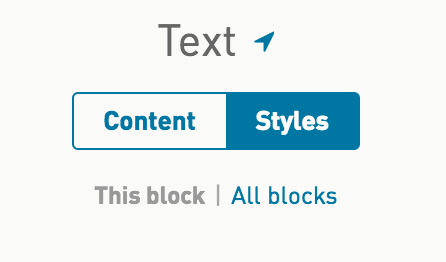 This will default to edit styles for 'This block'. 4. Click open either 'Strong' or 'Emphasis'. 5. Update the Color field with your desired highlight color. 6. Toggle over to the Content tab of the text block. 7. Highlight the word(s) and select either 'B' or 'I' to set your color. Highlight the word(s) you would like to be a different color and click on either the B (for bold, also known as <strong>) or I (for italics, also known as <emphasis>) to add the color you have set for these styles. Example of applying bold (<strong>) to one word.